Ctrl + Alt + Delete on Windows provides a variety of functions, the main one of interest being the Task Manager. Is there an equivalent keyboard shortcut & indeed Task Manager for carrying out such tasks as quitting an application that maybe "hanging" (amongst other things) for Apple Macs, or indeed anything similar ? The keyboard shortcut you’re looking for is ⌘ + ⌥ + ⎋, alternatively known as command + option + escape. 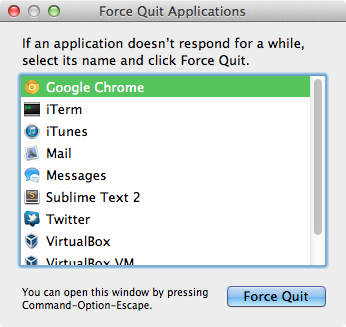 This will bring up the Force Quit Applications window (see screenshot below). The equivalent of the Windows Task Manager is The Activity Monitor app. The equivalent of Close Session or Shut Down are found in the Apple Menu. The equivalent of Change Password is the Users pane of the Configuration app. The equivalent of Lock Computer is "Login Window..." under the User (your user name) menu. Pressing cmd-shift-Q brings up the quit session confirmation dialog. Alt/Option-Command-Esc to force applications to quit. For Task Manager style stuff Activity Monitor is it by default and its not key invoked. Keyboard Shortcut: You key combo. You can use Activity Monitor and create a global keyboard shortcut to it via BetterTouchTool. I normally open terminal. Then use top and kill the process. see http://support.apple.com/kb/TA22781?viewlocale=en_US That is the answer to Ctrl + Alt + Delete on a PC. What's the Mac equivalent for CTR+ALT+Backspace on Linux?